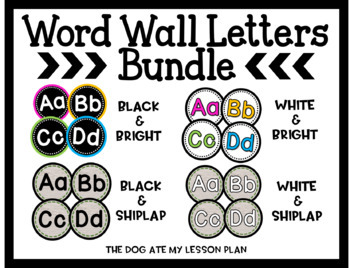 White and Bright & Black and Bright Word Wall LettersInclude Capital and Lowercase LettersCheck out the Homework Club Resource for matching theme.Looking for "Shiplap" Word Wall Letters? Check them out here. Black/Shiplap & White/Shiplap Word Wall LettersIncludes Capital and Lowercase Letters.Looking for "Bold & Colorful" Word Wall Letters instead? Check them out here! This Bundle included Bold & Bright and Shiplap Word Wall Letters.